If you think that this is just a fried croissant dough sprinkled with sugar & cinnamon then topped with vanilla cream, no, there is more to that. It is difficult to take croissant pastry dough and fry it like a doughnut without making each laminated layer go separate ways once it touches hot oil. Other way, some attempts will make them look gross and lumpy. 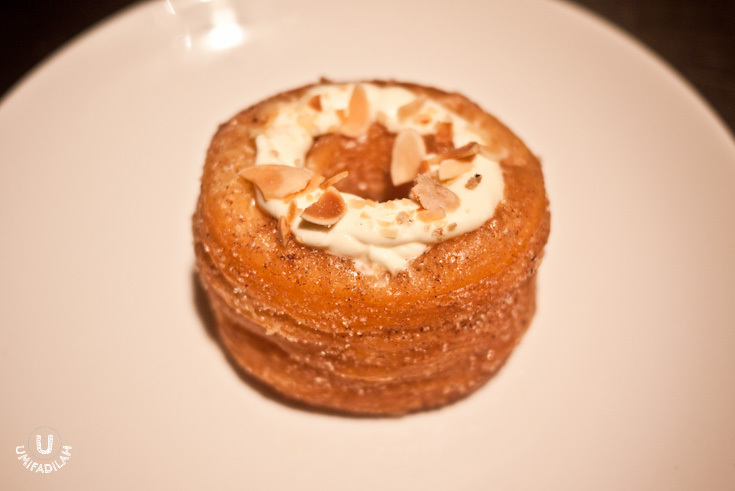 Which is why, experts say that cronut is to be taken as a bold step forward for pastry - it needs a certain degree of culinary skill and even Ansel had to experiment with 10 different recipes before he achieved the perfect texture. Taking 2 months and more than 10 recipes, Chef Dominique Ansel’s creation is not to be mistaken as simply croissant dough that has been fried. Made with a laminated dough which has been likened to a croissant (but uses a proprietary recipe), the Cronut™ is first proofed and then fried in grapeseed oil at a specific temperature. Once cooked, each Cronut™ is flavored in three ways: 1. rolled in sugar; 2. filled with cream; and 3. topped with glaze. Cronuts™ are made fresh daily, and completely done in house. The entire process takes up to 3 days. When something has gone viral, Jakarta just can’t miss it. Good news, Mandarin Oriental Cake Shop that is well-known for their cakes & pastries for ages, is starting to serve their interpretation of cronuts since yesterday, Monday July 15th. It’s called ‘Kronut’ (with K) and although it has gained some popularity on the Twitterland through the foodie buzz and media coverage, we’d still love to call’em cronuts (with C). MO Cake Shop sells Kronut for ONLY IDR 20.000/pcs, which is less than half of Ansel’s original. Which I really really think that they hit the right spot for Jakarta's market – trust me, people in here wouldn’t scratch out their pocket for some IDR 50.000 (equals $5) dessert item per piece. So yes, call me a hipster foodie, but yesterday I finally tried my first Kronut ever. Here in MO Cake Shop you cannot just walk-in and get your Kronut, they don’t even have it displayed and no cronuts sign whatsoever (as of now). It is said that you have to dial +62(21) 29938820 and place your order a day before. But I guess I was super lucky yesterday. Had a meeting near the MO Hotel and that was when I impulsively decided to test my luck so I called the number on my way there using a cab. I asked to buy 5, when the cashier said that I cannot. So I had to bargain: “Okay how about I buy only TWO? Please.” She said OK. The luckiest part was when I came in, two ladies greeted me and turns out one of them was the store manager, Fitri Indah Hastuti. I asked permission to take photos and everything, until she told me that another customer cancelled their order so I get to take all 5 Kronuts. BIG WIN OF THE DAY. LOL. 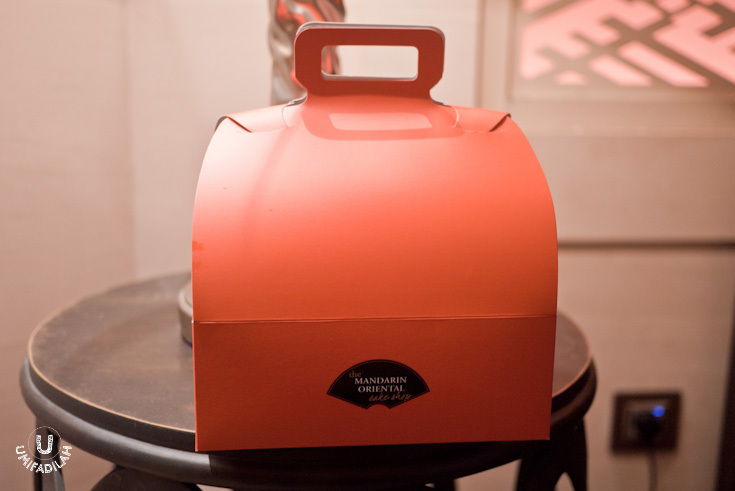 Kronut by Mandarin Oriental Cake Shop. Priced at IDR 20.000/each (before tax). This is Mandarin Oriental Cake Shop's interpretation of cronuts. Called 'Kronut', this delicate & flaky pastry layers are sprinkled with cinnamon and sugar, then topped with delicious vanilla cream and almond chunks. Creation of Chef Wita Girawati of MO Shop Cake. Kronut being cut in half, but not by a serrated knife as per Dominique Ansel's guide, so it might not look as good as the advertised cronuts photo on the internet, but yes I can see the delicate croissant layers filled with cream. OMG DROOLING. The lowlight part was that I couldn’t taste them right away. I blame them for launching it in a Ramadhan fasting month, haha :p That’s okay, but cronuts do have a short shelf life for only 6 hours. When I ate them 5-hours-post-purchase, the taste might be slightly different and the dough gets a bit soggy already, but I can tell you one thing: even the mimic's creation was SO DAMN GOOD and if you ask me does it lives up to the hype, YES, IT DOES. I kind of understand why people would queue in line for this, it's a type of pastry with texture that has never been invented before. It's a combination between perfectly delicate, laminated crunchy croissant layers, with vanilla cream filling, strong hints of cinnamon & sinfully sugary coating, and it makes you wanna take another bite, and another bite again. Gosh, so good. I don't ever wanna know how much calories in 1 cronut is there. People are starting to move on from cupcake, red velvet, and rainbow cake hype and I trust my gut that this is indeed 'The Next Big Thing'. Save your spot before it goes super famous! Note: This post is as hipster as I could ever be. I might as well join the cronut movement. LOL. I went to Mandarin Oriental Cake Shop again yesterday, to entertain a guess whose been damn curious about this whole cronut thing. It’s sad to say (and I hope I was just out of luck), but I honestly thought that their Kronuts quality is somehow.... degrading. In only a month or so. Moreover after I have a taste comparison to Noshbakers’ Valrhona Marsbar Cronuts at Publico. Man, suddenly MO’s Cronuts feel more like just a typical fried doughnut. The laminated layers are no longer thin, light and airy – but more like damp, wet layers that stick together (we call it in Bahasa Indonesia as “bantet”) and tasted more like a bread dough, not a croissant dough. Delicious still, but I expect more refined layers and I hope they get it fixed soon otherwise people would get the whole idea wrong about how good is Cronut supposed to be. I sure hope I was just having a bad day. Where is consistency when we need it the most?